Colon cancer, also known as colorectal cancer, is the third-leading cause of deaths from cancer in the United States, for both men and women. The risk increases with age and it is more common in some races than others. If you have a family history of colon cancer, are suffering from it yourself, or have survived treatment, a new study reveals vital information that could help increase your chances of survival and relieve your symptoms. I would like to share some valuable information about a simple snack that is associated with significant improvement in chances of survival in patients with stage 3 colon cancer. According to a recent observational study of people with stage 3 colon cancer, adding tree nuts to their diet led to better outcomes. The consumption of tree nuts, like almonds, pecans, and walnuts, had a positive effect on survival and recurrence risk for these patients. The study researchers examined a questionnaire about dietary intake from a clinical trial of 826 patients with stage 3 colon cancer. All patients received surgery and chemotherapy to treat their colon cancer. Among the 19% of patients who consumed two or more ounces of nuts per week, the risk of recurring colon cancer was reduced by 42% and the risk of death was cut by 57%. I’d say that’s pretty significant! Especially in the battle against such a deadly cancer. Temidayo Fadelu, MD, reported that “nut intake was associated with significant improvement in disease-free survival and overall survival in this patient population of stage 3 colon cancer patients.” He presented the findings on May 17 before the 2017 annual meeting of the American Society of Clinical Oncology (ASCO). The study supported evidence that changes in diet and lifestyle can bring about protective benefits in colon cancer survivors. But not all nuts provide these benefits. A second analysis in the study discovered that only those who consumed tree nuts were at an advantage. So peanuts did not have the same benefits. Fadelu suspects this is because peanuts are legumes with a different biochemical makeup than other tree nuts. The benefits of tree nuts don’t end there! Fadelu noted that nut intake is also associated with lower cardiovascular mortality and lower incidences of obesity, type 2 diabetes, insulin resistance, and metabolic syndrome. Each of these conditions is also linked with a higher risk of recurrence of and death from colon cancer, so these findings are exceptionally beneficial. 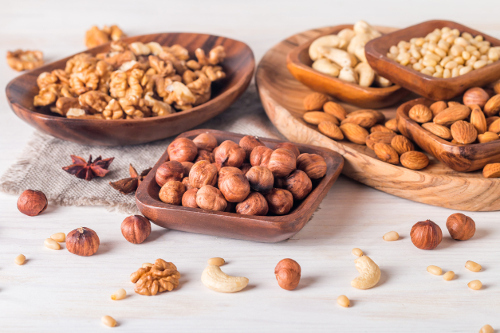 Researchers are continuing to explore the potential positive impact of nut consumption on other stages of colon cancer, but until those results are revealed, it won’t hurt to add more tree nuts to your diet! Especially if you’re at risk for colorectal cancer. So get your two ounces of almonds, Brazil nuts, cashews, hazelnuts, macadamia nuts, pecans, pine nuts, pistachios, or walnuts every week. Choose salt- and sugar-free varieties and eat them as a snack or add them to salads, cereal, or stir fries. You can also make pesto with pine nuts and use it on some lean protein, like fish or chicken. Green, L., “Eating Nuts Can Improve Colon Cancer Outcomes, Study Finds,” Cure Today, May 18, 2017; http://www.curetoday.com/articles/eating-nuts-can-improve-colon-cancer-outcomes-study-finds, last accessed May 25, 2017. Steenhuysen, J. “Eating tree nuts may cut risk that colon cancer will return: study,” Reuters, May 17, 2017; http://www.reuters.com/article/us-health-cancer-nuts-idUSKCN18D2P8, last accessed May 25, 2017.